Saudi security forces on Friday foiled an imminent terrorist plot targeting the Grand Mosque in Makkah, the Interior Ministry’s security spokesman Maj. Gen. Mansour Al-Turki said. He said the operation was planned by three terrorist groups, two based in Makkah and the third in Jeddah. 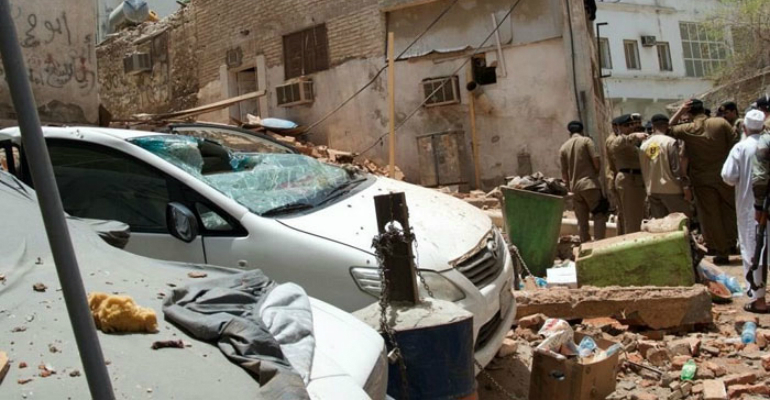 The foiled attack targeted worshipers at the mosque, the Saudi Press Agency quoted Al-Turki as saying late Friday. The first operation was foiled in Makkah’s Aseelah district, while the second was thwarted in Ajyad Al-Masafi neighborhood, which is within the central area of the holy city. A suicide bomber, who was hiding in a three-story building in the Ajyad neighborhood, opened fire on security forces after refusing to comply with calls to turn himself in. He later blew himself up after the security forces tightened the noose around him. The building collapsed due to the force of the explosion. Six expatriates were injured in the incident and were rushed to hospital. Five members of the security forces were slightly injured. Security forces arrested five suspects, including a woman, who are currently being investigated. Identities of the suspects cannot be disclosed as investigations are still under way, the spokesman said.